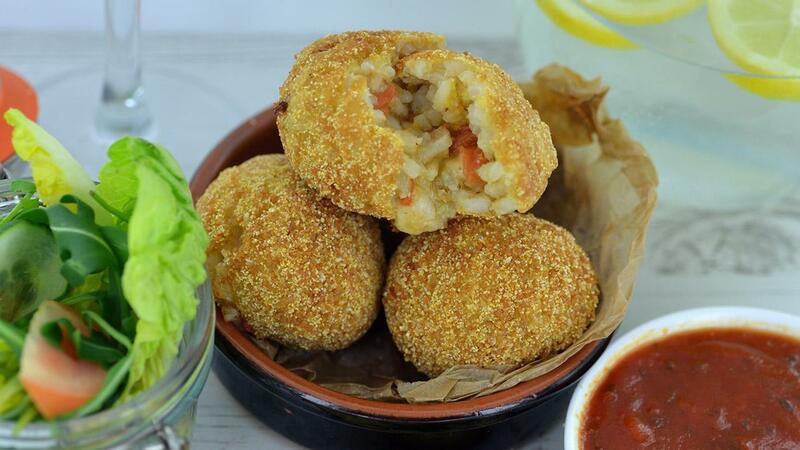 Arancini di Riso with a spicy spin? Check out our Arancini di Riso roasted corn, jalapeno and cheddar recipe. Jalapenos are a member of the capsicum family and originating from South America. They are about 4 cm long, dark green when young and scarlet when ripe. Bring the water to the boil then whisk in the KNORR Paste Bouillon. Heat the oil then add the onions and cook for 2-3 min. Add the rice and cook for a further 2-3 min. Add ¼ of the bouillon and cook until the rice has absorbed the liquid then repeat until the rice has softened but still has bite. Grill or char grill the corn on the cob until slightly charred looking then remove and allow to cool. Stand the corn on its end then cut the kernels from the cob. Separate the kernels. Dice the jalapenos and add to the sweetcorn. Mix the breadcrumbs and semolina together then place into a shallow tray. Crack the eggs and lightly beat then pour into a separate shallow tray and pour the flour into another shallow tray. Mix the sweetcorn and cheddar into the cooked rice. Take roughly 40g balls of the rice and roll then dip into the flour then egg and finally the breadcrumbs ensuring the rice is completely covered. Carefully place the balls into the hot oil and cook for 3-4 min. or until golden brown then remove and drain on kitchen paper. Pour the water and KNORR Tomato & Basil Concentrate sauce into a saucepan and bring to a simmer. Cook for 2-3 min. or until the sauce thickens then pour out into dip pots. Serve 3 arancini with a portion of sauce to dip into.